The Pexp-1 is an expander module for Pamela's NEW Workout offering additional dedicated fixed clocked outputs. 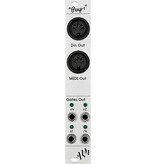 Extend Pam as a master to clock external gear with a super solid MIDI & Din Sync dedicated clock outputs. Use extra fixed jack clocked gate outputs to free up Pamela outputs for more exotic modulation dutys. Connects to and is powered by an expander header on rear of Pamela's NEW Workout.